I am offering one six month old baby boy for sale as is. He is in the 90th percentile for both height and weight, has shown no signs of serious illness and he has all of his vaccines up to date. He is a delightful and enjoyable boy with a precious smile and adorable laugh. Currently he is learning to gain mobility via rolling and to eat small bits of food. In fact he is a great eater. He has already been introduced to wheat, egg and dairy through yogurt with no ill effects. Banana and avocado puree remains his favorite meal which he eats at least once a day. You might be interested to know that he has been exposed to dogs, cats, and older children and he interacts with all very well. While over all I have been happy with our newest baby we have had one recurring concern. He seems unable to fall asleep unless nursed by his mother in our bed or for reasons I don’t understand, in his playpen at daycare. 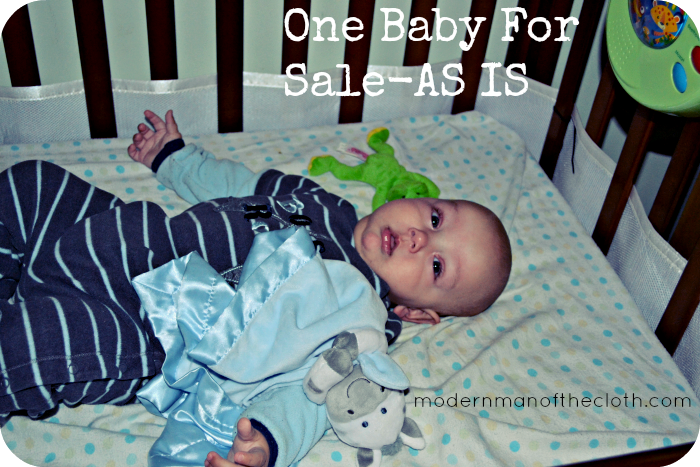 I am selling this baby AS-IS so please do not request him with improved sleep ability. Fine Print- Please note this is a joke born out of some frustration. Please don’t try to buy my son, or report me to the police. We haven’t done it yet. And we really need to. At 6 months Simeon and Ariella were much, much better sleepers. I think this is part of that last child lazy thing I mentioned a while back.